Synergy Turbo Fuel Rail - Dezod Motorsports Inc - Home of the automotive performance enthusiast since 2002. Synergy Fuel Rails allows for increased fuel to help provide more horsepower. The Synergy Turbo Fuel Rail kit flow-through design helps eliminate hydraulic fluctuation. 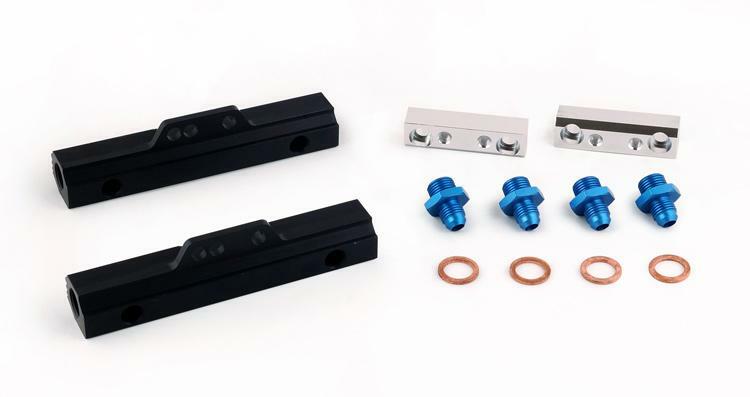 The fuel rails are anodized for corrosion resistance and feature -6 AN high pressure ports. These billet fuel rails have a 5/8 in. i.d. through-hole, which provides flow capabilities to support high horsepower engine builds racing.